Universal Studios Hollywood has been added to your itinerary. On the 26th (Wed), get in on the family fun at Universal Studios Hollywood. To find more things to do, photos, ratings, and more tourist information, use the Los Angeles travel route planner. Brussels, Belgium to Los Angeles is an approximately 15-hour combination of train and flight. You can also fly. The time zone changes from Central European Time to Pacific Standard Time, which is usually a -9 hour difference. Prepare for somewhat warmer weather when traveling from Brussels in June: high temperatures in Los Angeles hover around 30°C and lows are around 19°C. Wrap up your sightseeing on the 27th (Thu) to allow time to drive to Laughlin. Laughlin is an unincorporated town and census-designated place in Clark County, Nevada, United States, and a port located on the Colorado River. On the 27th (Thu), try your luck at Harrah's Laughlin and then examine the collection at Don Laughlin's Classic Car Collection. For photos, maps, where to stay, and tourist information, read our Laughlin itinerary maker site . Getting from Los Angeles to Laughlin by car takes about 5 hours. Other options: do a combination of flight and shuttle; or take a bus. Due to the time zone difference, you'll lose 1 hour traveling from Los Angeles to Laughlin. When traveling from Los Angeles in June, plan for warmer days and a bit warmer nights in Laughlin: temperatures range from 49°C by day to 31°C at night. Wrap up your sightseeing on the 28th (Fri) to allow time to drive to Grand Canyon National Park. Start off your visit on the 28th (Fri): take in a show at Hopi House, hike along South Kaibab Trail, and then explore the stunning scenery at Grand Canyon South Rim. For more things to do, other places to visit, ratings, and tourist information, use the Grand Canyon National Park visit site . You can drive from Laughlin to Grand Canyon National Park in 3.5 hours. Traveling from Laughlin in June, things will get colder in Grand Canyon National Park: highs are around 34°C and lows about 6°C. Finish up your sightseeing early on the 29th (Sat) so you can go by car to Monument Valley. Monument Valley is a region of the Colorado Plateau characterized by a cluster of vast sandstone buttes, the largest reaching 1000ft above the valley floor. Start off your visit on the 29th (Sat): take a pleasant ride with a tour on horseback, see the interesting displays at Goulding’s Trading Post Museum., and then take in the dramatic natural features at Monument Valley Navajo Tribal Park. Plan my Monument Valley trip by asking Inpirock to come up with tips and suggestions. Getting from Grand Canyon National Park to Monument Valley by car takes about 3.5 hours. Traveling from Grand Canyon National Park in June, expect a bit warmer with lows of 14°C in Monument Valley. Wrap up your sightseeing on the 30th (Sun) early enough to drive to Page. Start off your visit on the 30th (Sun): stroll through Lone Rock Beach, then have fun at Gunfighter Canyon, then take in the dramatic natural features at Horseshoe Bend, and finally take in breathtaking views at Antelope Canyon. To find photos, ratings, reviews, and more tourist information, use the Page trip planner . Traveling by car from Monument Valley to Page takes 2.5 hours. Plan for a bit warmer temperatures traveling from Monument Valley in June, with highs in Page at 41°C and lows at 24°C. Finish up your sightseeing early on the 1st (Mon) so you can travel to Bryce Canyon National Park. Kick off your visit on the 1st (Mon): identify plant and animal life at Rim Trail, take in the dramatic natural features at Bryce Amphitheatre, then stop by Ruby's Inn Canyon Rock Shop, and finally tour the pleasant surroundings at Navajo/Queens Garden Loop. To see maps, traveler tips, reviews, and other tourist information, use the Bryce Canyon National Park online holiday planner . Traveling by combination of shuttle and car from Page to Bryce Canyon National Park takes 3 hours. Alternatively, you can drive. While traveling from Page, expect slightly colder days and colder nights in Bryce Canyon National Park, ranging from highs of 32°C to lows of 10°C. Finish up your sightseeing early on the 2nd (Tue) so you can go by car to Las Vegas. Give yourself a bit of retail therapy at The Strip and Barneys New York. Get in touch with nature at Red Rock Canyon National Conservation Area and Lake Mead National Recreation Area. Take a break from Las Vegas with a short trip to Willow Beach in Fort Mohave, about 1h 10 min away. The adventure continues: make a trip to Bellagio Fountains, examine the collection at The Mob Museum, get the adrenaline pumping with an extreme tour, and take in nature's colorful creations at Bellagio Conservatory & Botanical Gardens. Planning Las Vegas trip won't be overwheling when you use's Insprock itinerary maker. You can drive from Bryce Canyon National Park to Las Vegas in 5 hours. Other options are to do a combination of car and flight; or do a combination of car, bus, and flight. The time zone changes from Mountain Standard Time (MST) to Pacific Standard Time (PST), which is usually a -1 hour difference. In July, Las Vegas is much hotter than Bryce Canyon National Park - with highs of 47°C and lows of 32°C. Finish your sightseeing early on the 5th (Fri) so you can drive to Death Valley National Park. Kick off your visit on the 5th (Fri): contemplate the long history of Harmony Borax Works, cruise along Artists Dr, and then take in the dramatic natural features at Zabriskie Point. To find reviews, other places to visit, more things to do, and more tourist information, go to the Death Valley National Park trip itinerary maker tool . Traveling by car from Las Vegas to Death Valley National Park takes 2.5 hours. Alternatively, you can take a bus. Expect slightly colder evenings in Death Valley National Park when traveling from Las Vegas in July, with lows around 26°C. Wrap up your sightseeing by early afternoon on the 6th (Sat) to allow time for the car ride to Yosemite National Park. 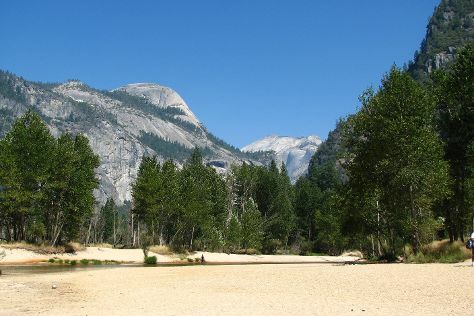 Kick off your visit on the 7th (Sun): take in the dramatic scenery at Yosemite Falls, take your sightseeing to a higher altitude at Cathedral Beach Picnic Area, then trek along Panorama Trail, and finally don't miss a visit to Olmsted Point. On the 8th (Mon), you'll have a packed day of sightseeing: explore the striking landscape at Lembert Dome. To find ratings, other places to visit, more things to do, and tourist information, read our Yosemite National Park trip maker website . Traveling by car from Death Valley National Park to Yosemite National Park takes 8 hours. Alternatively, you can do a combination of car and bus. When traveling from Death Valley National Park in July, plan for slightly colder days in Yosemite National Park, with highs around 33°C, while nights are colder with lows around 9°C. On the 8th (Mon), wrap the sightseeing up by early afternoon so you can drive to San Francisco. For other places to visit, traveler tips, photos, and more tourist information, refer to the San Francisco trip itinerary planning site . You can drive from Yosemite National Park to San Francisco in 4 hours. Alternatively, you can do a combination of car and flight; or do a combination of bus and flight. Traveling from Yosemite National Park in July, expect nights in San Francisco to be a bit warmer, around 16°C, while days are a bit cooler, around 26°C. On the 10th (Wed), you're off tohome.